Dr. Denneal Jamison-McClung is Interim Director of the Biotech Program at UC Davis, as well as Director of BioTech SYSTEM and DEB Program Coordinator. She also serves on the Our Voices blog editorial board and as an ex officio member of the UC Davis ADVANCE management team. She has utilized Wiki Education’s tools and support in her Biotech courses. This is a republishing of her post about how women and allies in STEM can make Wikipedia more representative of all people. In our cyber-connected modern world, many people search the internet via smartphones as a first step when learning about new topics. Wikipedia, in particular, is a “go to” source of information and is the fifth most popular website in the world, racking up millions of views per day. Given Wikipedia’s ubiquity as an information source, the quality and scope of information provided on the platform has the power to shape our collective understanding of the world around us. Wikipedia’s volunteer editors tackle the behemoth task of curating the information added to the site by the public, including decisions about which contributed pages or paragraphs are “notable” and should be maintained and which pages should be deleted. In recent years, the Wikimedia Foundation (WMF) has been asking vital research questions about the influence of editor diversity (the vast majority [~85%] of Wikipedia editors are male) on the breadth of content available on the site. 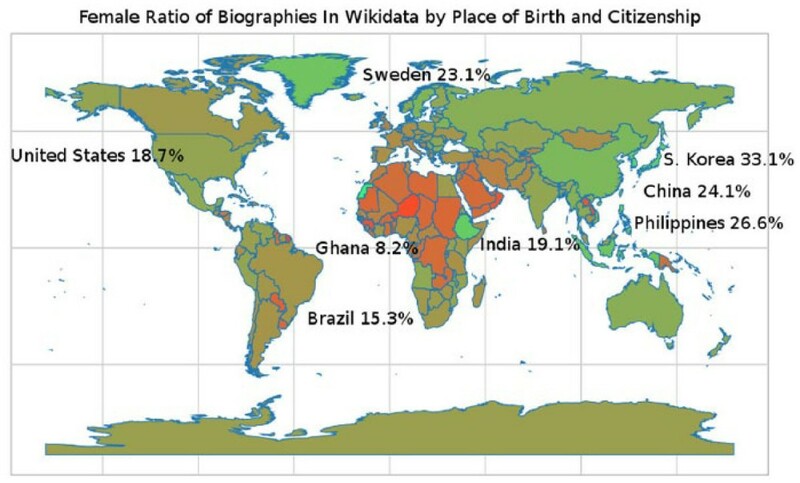 Klein and Konieczny (2018) recently published an analysis of the ratio of biographies of women and non-binary-gendered notable individuals to the total number of Wikipedia biographies (called the Wikidata Human Gender Indicator [WHGI]) across different cultures. Around the world, biographies of women are underrepresented on Wikipedia though the balance is shifting toward parity (expected in February 2034 given their analysis of ~2014 WHGI data…sixteen more years to go?!). The lack of diversity in Wikipedia biographies of notable individuals extends to women in STEM. Ongoing lack of representation in the largest, most frequently accessed body of knowledge in the world contributes to the silencing of our voices. To help change cultural perceptions of who can contribute to STEM and to inspire the next generation of young scientists and engineers, it is essential that open access platforms, especially Wikipedia, offer a realistic perspective on the diversity of people already working to tackle big global challenges and historical contributions by underrepresented groups. Let’s speed up the process… sixteen more years to achieve gender parity on notable biographies is too long! What can women and allies in STEM do to accelerate the improvement of Wikipedia as an inclusive, fact-based resource for the global community? Brainstorm a list of the notable academics in your own research community and check to see if a Wikipedia page exists for those individuals, as well as whether they meet the platform guidelines for notability. Incorporate a “wiki writing” assignment into existing courses or work with humanities colleagues to develop new, interdisciplinary courses that highlight the diversity of STEM scientists. Organize an “editathon” event that brings together students and colleagues to add or improve Wikipedia pages on notable STEM professionals from underrepresented backgrounds. Start a Wikipedia page for a person in your discipline who you know of, but have never met or have had only limited interactions (limits potential conflict of interest). Contribute related open access content to Wikimedia Commons (e.g. articles, photos, illustrations, drawings, videos) in your topic area of expertise. This is a republishing with permission from the author. See the original post here. Header image: File:UC Davis campus buildings and scenes (16188061937).jpg, UC Davis Arboretum and Public Garden, CC BY 2.0, via Wikimedia Commons.